wpw006111 WALES (1921). 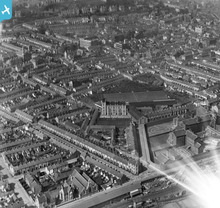 View of Swansea showing Vetch football ground with match in progress, and the prison, oblique aerial view. 5"x4" black and white glass plate negative. 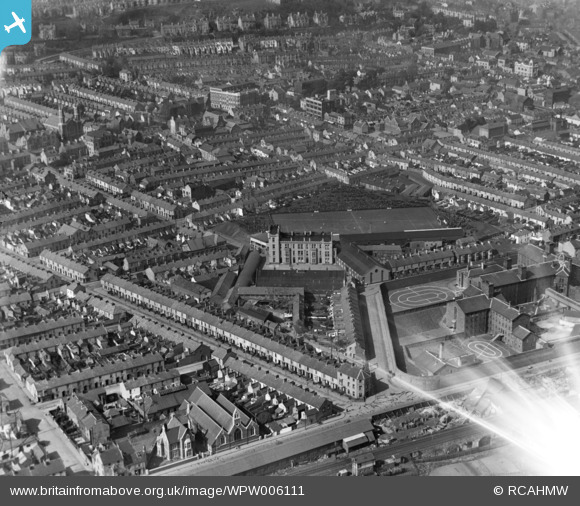 Title [WPW006111] View of Swansea showing Vetch football ground with match in progress, and the prison, oblique aerial view. 5"x4" black and white glass plate negative. Vetch Field. football match in progress. Approx site of Plaza Cinema, yet to be built. Albert Hall Cinema, still standing but only just! Empire Theatre Oxford St, demolished 1958 for a Fine Fair supermarket to be built on site. Original stage yard get in still visible in Singleton St.
Grand Theatre. Not original Stage house and fly tower, completely rebuilt during restoration 1980s. Note that the double decker stand at the Vetch has not even been built at this date, 1921.
with match in progress date unknown. Incredible. I looked at the streets - not a car in sight. Then looked outside the Glamorgan pub, is that the remains of all the horse and carts that would have brought there on the day? Perhaps bringing some of the fans. Looks like horse poo and water running off to the drains where the horses have been fed and watered?